Buxar is a city in the state of Bihar in the eastern part of India bordering eastern Uttar Pradesh. It is the headquarters of Buxar District. The word Buxar is said to have been derived from Vyaghrasar. The tiger face of Rishi Vedshira, an outcome of the curse of the sage Rishi Durvasa, was restored after bathing in a holy tank which was later named as Vyaghraar. The present district of Buxar consists of areas under Buxar Sadar and Dumraon Sub-Division of the old Bhojpur district and came in existence in the year 1991. Buxar town is the headquarters of the district and also its principal town. The district is bounded on the north by Ballia district of Uttar Pradesh (U.P. ), on the south by Rohtas district, on the west by Ghazipur and Ballia districts of U.P. and on the east by Bhojpur district. The town Buxar is located on the bank of river Ganges (Ganga). A road bridge over the Ganga connects Buxar with Ballia District in the neighboring U.P. state. The town is also connected to the state capital Patna by rail and road routes. The Buxar railway station is a major station. Many major trains pass through the station due to its strategic location. The spoken language is Bhojpuri, written in Devanagari script. Substantial proportion of trade activities are with well connected towns and cities in Uttar Pradesh such as Varanasi, Ballia and Ghazipur. In addition to mythological references of Buxar modern historical record are limited to two battles. The earliest of the two was fought between the Mughal dynastic descendant Humayun and Sher Shah Suri at Chousa in 1539 A.D. The battle was won by Sher Shah Suri who is acclaimed for his visionary contribution the Grand Trunk Road project. 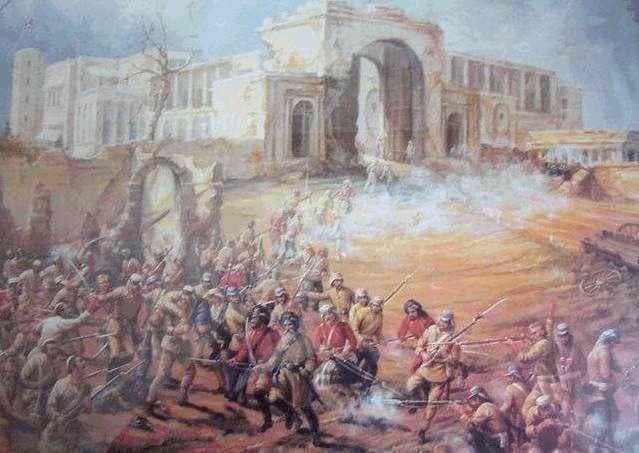 In 1764 the Battle of Buxar was fought (see below). In Hindu religious literature, Buxar is believed to be referenced as "Siddhashram", "Vedgarbhapuri", "Karush", "Tapovan", "Chaitrath", "VyaghraSar". Some claim that the history of Buxar dates back even prior to the period of Ramayana. In the period of Ramayana, Buxar had acquired a prime place, as the Vishvamitra Ashram was located (now located at Charitravan near M.V. College). This was the place where Bhagawan Rama killed Tadaka(Rakchhasi). The place of Tadaka Vaddh is located at Noulakhaa Mandir. The etymology of word Buxar is "Vyaghra + Sar"; Sanskrit words that mean, Tiger and Pond respectively. Presumable suggestive of a pond or lake which was visited by tigers of the region. This is the most accepted origin of the name of the town. Another story relates the name to tiger face of Rishi Vedshira, an outcome of the curse of the sage Rishi Durvasha, was restored after bathing in a holy tank which was later named as Vyaghrasar. Stretching over an area of 1,62,380 hectares. Buxar lies on the border with the neighboring state of Uttar Pradesh. River Ganges (Ganga) forms the border in north and in the west river Karmanasa. The entire strip of land between the river Ganga and stretches in south beyond main line of the Eastern Railways. The land form is low lying alluvial plain of river Ganga and her tributaries- Thora and Karmanasa. The river Karmansa joins the Ganga near Chousa. The region is considered to be the best wheat growing area in the State and India. Agriculture is the main occupation of the majority of the people of this district. One major canal passing through this district has been the source of irrigation for the farmers along with its subsidiary channels. However, over time it has not been receiving the due care and maintenance that it needs and hence, it has become a less reliable source of irrigation, particularly, at the lower end of it. The farmers are engaged in growing rice, wheat, sugarcane, potato, jowar, bajra, maize, sunflower and all varieties of green vegetables. The district is abundant with mango trees. The district has various banks which provide loans to farmers.